Seriously, this is a great example of a coward hiding behind anonymity. Stand up and sign your ‘letter’. I used to build crazy complex Christmas tree lighting control systems years ago, before we had microcontrollers and the like, all based on hard logic chips, and manual programming. I got a bit of a shock one year, when someone I worked with asked me when the tree was going up so they could bring the kids over to see it, and let their friends know. That’s a thing of the past now, since just about any cheap Chinese Christmas light set does many time more than my pre-microcontroller lash-ups, and now that they can have hundreds of LEDs hung on to them, it would be madness to try. I think the only advantage my systems still have is that a bare wire wouldn’t be likely to kill you. I think most Christmas lights now on offer are marginal on safety at best, so I suggest being careful, very careful. Anyway, there was a very UN-Christmassy story in the news tonight. A West Lothian grandmother who decorated her house for Christmas was shocked to receive a nasty card that branded the festive display “awful” and the “worst” on the street. Annette McDonald, from Glenmore in Whitburn, has lit up her house and garden with fairy lights, a Santa Claus and a star. 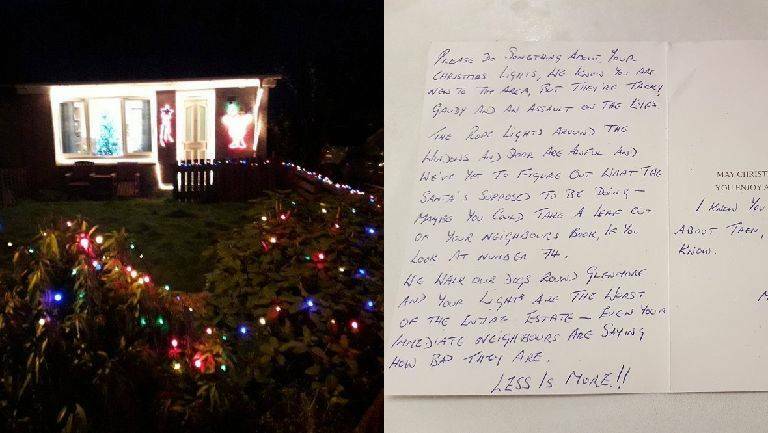 The 55-year-old put up the display for her young grandchildren, but was stunned to receive a card in the post from a woman in the area that called it “an assault on the eyes”. Mrs McDonald told STV News the card was cowardly, rude and offensive. In the letter, the woman told her that “less is more”. The writer doesn’t deserve to have a happy or merry Christmas after that. I had to give up my displays. The writer doesn’t know the circumstances of the person putting up the lights. They could potentially be suffering a tragedy, and a display the writer doesn’t like could be giving them great comfort. Alternatively, the “awful and worst” display could be all they can afford, and perhaps had to make sacrifices elsewhere for a little piece of seasonal pleasure. If the display pictured is “awful and worst”, then I suggest the writer come to the east end of Glasgow. If, as they say, “LESS IS MORE!”, then they could have a full-time job writing their rude and nasty letter to just about every one of my neighbours. Those who put up displays seem to have more money than sense these days – their houses are draped with lights, and Christmas characters, while their gardens are full of reindeer, sleighs, snowmen, and animated characters. I don’t bother taking pics, usually, since they are so bright there’s no real ‘low light hand held’ challenge. Like the one below. This one also fails to convey the animation from a number of low power lasers shining on the scene, and the shower of animated lights suspended along the eaves. Maybe Little Miss Nasty would prefer this, on the ‘Less is More’ theme? SOMEBODY knows who she is. She won’t have been able to keep her mouth shut, and will have been telling all her friends what a good job, putting the person behind that ‘awful’ display in their place. I think its a man behind that letter, and not a woman. It’s the style of writing that makes me think that way. At a guess, it’s also a pensioner. Not many write by hand nowadays. There is actually a surname (redacted) so I guess they know who it is in reality, and that is a woman. Maybe the real story here is bad blood and history between the parties concerned. Hard to get Christmas cards in lightweight printers these days! I guess they called it a ‘letter’ in the story due to the long message.